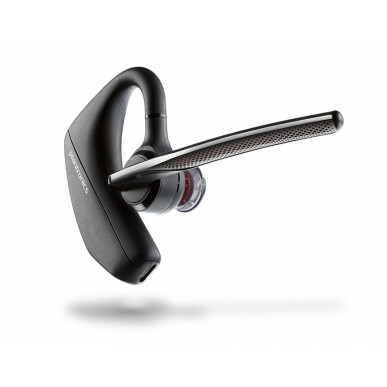 It's a worthy part of Plantronics' very popular Voyager range of headsets and offers the convenience of connection to mobile phones or tablets by Bluetooth, with the ability to connect to computers using the USB dongle supplied. The 5200 is both an over & in-ear style - but with an improved fit to previous Voyager models that makes it ideal for smaller ears. 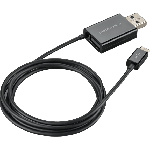 It has a good length microphone boom to pick up your voice with clarity and quality, thanks to the inclusion of Quadruple-mic active digital signal processing (DSP) and six layers of WindSmart technology. Fantastic! 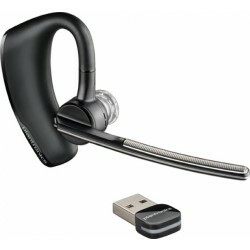 Plantronics have also adjusted the button positioning to make for easier answering. 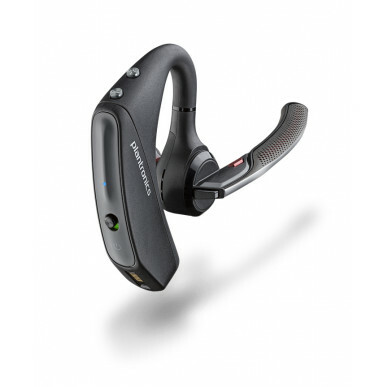 The Smart Sensor Technology senses when you pick up or put down the headset and routes your calls either to the mobile, or the headset. The Voyager 5200 will also announce who is calling so you know whether to use the voice prompts to 'answer' or 'ignore' the call. We all know that feature comes in very handy at times, right? 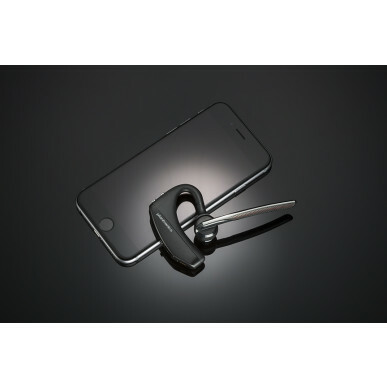 The headset will be simultaneously paired with the dongle and one BT device, so you can easily switch from computer to mobile phone use. Also - you can use it to listen to music and podcasts from your mobile, or other bluetooth device. The handy travel case keeps the headset, dongle and cable all together when not in use and also doubles as a stand and charging base, when on your desk. 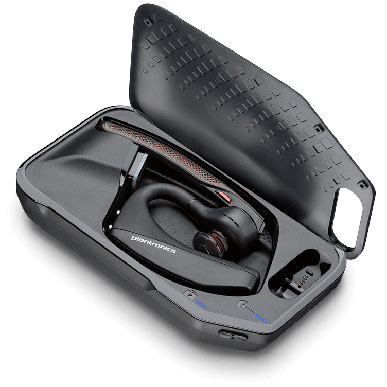 When you're on the go the case protecst the headset and also charges it (when the case is charged). 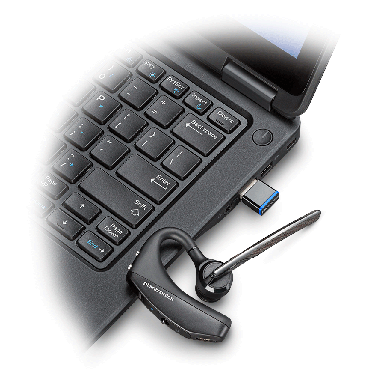 Unlike previous models, this works easily for use with Lync and Skype for business, as well as other programs. 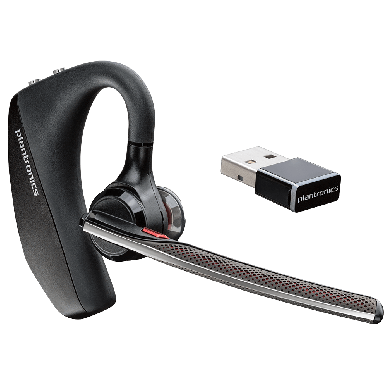 With handy extra features, such as on-screen battery level display for iPhone & Android Visual mute indicators, locate your lost headset, language selector AND wireless updates available via the Plantronics hub, this headset is easy to love. 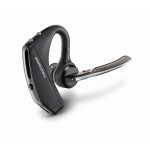 Bluetooth V4.1 means that you get additional range from your headset with up to 98 feet/30 metres (depending on your device), as well as NFC-connection. Take a closer look - we know you'll be impressed. Your voice, your day, your way. LEAVE THE NOISE BEHIND Not in the office? Not a problem. 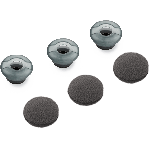 Four adaptive microphones and WindSmart® technology work together to eliminate disruptive background noise, wherever you are. Your voice sounds clear and professional as you seamlessly transition between environments, inside or out. Now you can focus on what you’re saying—not where you’re saying it. CONTROL BY COMMAND Stay in control. 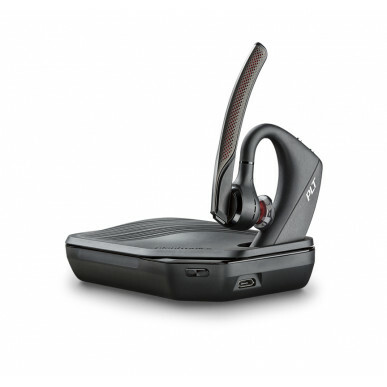 Make the Voyager 5200 UC an extension of your mobile life. 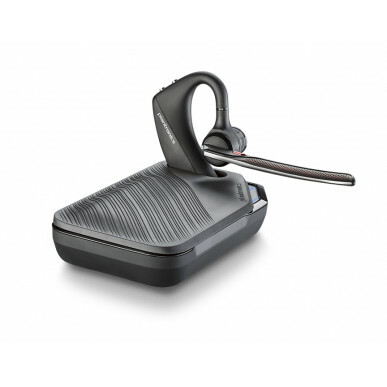 With one touch, the headset connects with Siri, Google Now, or Cortana so you can call phone contacts, send messages, schedule meetings, or even search the web - all via voice. Plus, voice alerts give talk time updates and even announce incoming callers. Simply say “Answer” or “Ignore” to manage calls without lifting a finger. 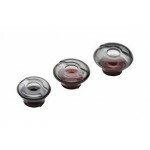 ADAPTIVE MICROPHONES Work together to reduce disruptive background noise. SMART SENSORS Smart sensor technology uses contextual intelligence to keep up with you. DYNAMIC MUTE ALERT Dynamic mute alert senses and alerts you when you talk when muted. WINDSMART TECHNOLOGY Detects wind direction and responds accordingly. COMFORT THAT LASTS The comfort-tested ergonomic design of the Voyager 5200 UC feels as good at the end of the day as it does at the start. 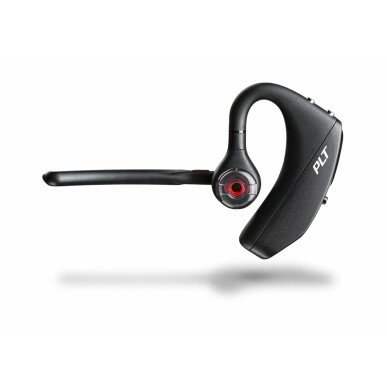 The ergonomic earpiece is designed to feel like it’s barely there. It’s a comfortable, powerful tool for all-day productivity. 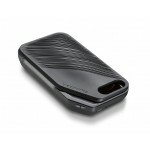 NEVER WORRY ABOUT MUTE AGAIN Simply press the dedicated mute button to switch mute on and off easily. The headset’s dynamic mute alert tells you immediately if you’re speaking while muted. Plus, timed voice alerts continually remind you when mute is still on. 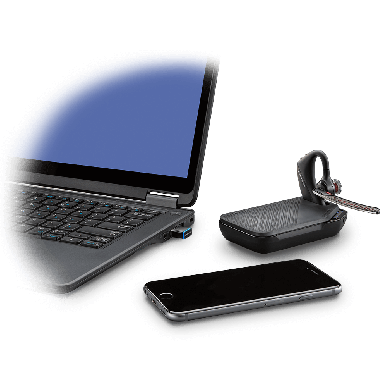 Combine that with desktop notifications and a visual mute indictor on the BT600 Bluetooth USB adapter, and you’ll never have to worry about an “oops” moment on an important call. THE POWER OF CONFIDENCE Wherever work and life take you, be ready to talk as long as you need with the included portable charging case with integrated docking stand. 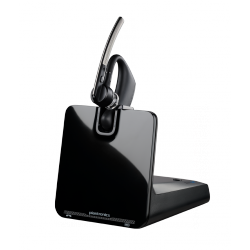 Completely charge your headset up to two full times, so you’re always ready to talk. SOFTWARE-ENABLED FUNCTIONALITY Use Plantronics Hub mobile app to locate your lost headset, change languages, wirelessly update firmware, or personalize settings and alerts. 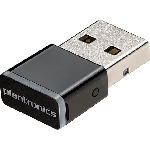 Use Plantronics Hub desktop software to view headset battery meter, change languages, update firmware, enable softphone call control, or personalize settings and alerts.